In this tutorial I’ll show you how to control 2 DC motors via bluetooth with an Android app created with MIT App Inventor 2. MIT App Inventor is a great platform to get you started with Android development. 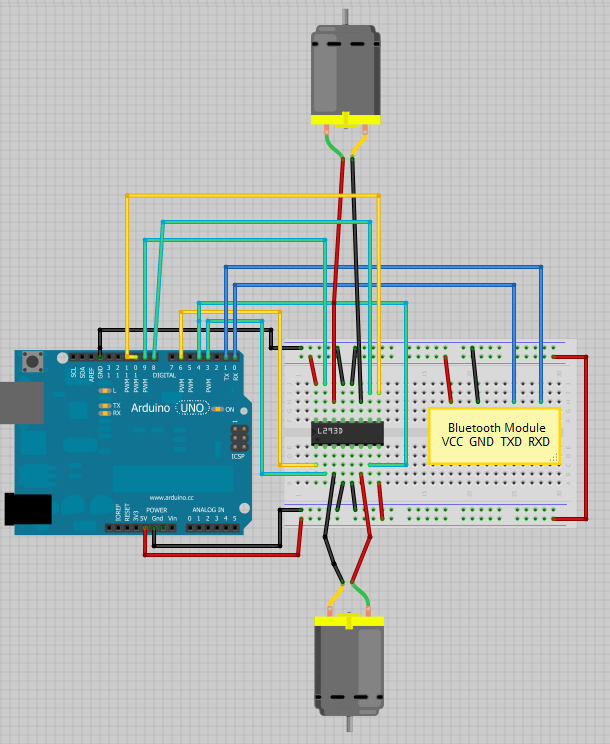 In a previous tutorial (click here to see that project), I was controlling 1 DC motor using an app called “BlueTerm”. That app did the job, but it’s not ideal to send constantly different commands in an easy manner. The app that you’re going to build is perfect to control any Arduino pin or to integrate with your own robot car. You can edit this app for your specific needs. To establish the bluetooth communication between your smartphone and your Arduino, you need a bluetooth module. This project uses the HC-05 bluetooth module (as shown in the figure below). This bluetooth module works with serial data. This means that the Arduino sends information and the bluetooth module receives it via serial (and vice-versa). By default the HC-05 bluetooth module operates at a baud rate of 9600. The Android App will be created using a free web application called MIT App Inventor. MIT App Inventor is a great place to get started with Android development, because it allows you to build simple apps with drag-n-drop. You need a Google account to sign up for MIT App Inventor and here’s the login page: http://ai2.appinventor.mit.edu. With MIT App Inventor you have 2 main sections: designer and blocks. The designer is what gives you the ability to add buttons, add text, add screens and edit the overall app look. The blocks sections is what allows to create custom functionality for your app, so when you press the buttons it actually does something with that information. I recommend that you start by following this project and using the app without modifying it. If want to make any changes to the app, when you’re done and you want to install the app in your smartphone, go to the Build tab. You can either generate a QR code that you can scan with your smartphone and automatically install the app in your smartphone. Or you can download the .apk file, connect your smartphone to your computer and move the .apk file to the phone. Simply follow the installation wizard to install the app and it’s done! For this project, you don’t need to install any Arduino libraries. So, you just have to download or copy the following code to your Arduino IDE, and upload it to your Arduino board. Make sure that you have the right Board and COM port selected. Note: before uploading the code, make sure you have the TX and RX pins disconnected from the bluetooth module! Follow the schematic diagram in the following figure to wire your circuit. If you haven’t generated the .apk file in a previous step, you can click here to download the .apk file (which is the Android app installation file). Move that file to your smartphone and open it. Follow the installation wizard to install the app. Turn on your smartphone’s Bluetooth. Tap on the newly installed app. Press the “Connect” button to connect your application to your Arduino Bluetooth module. People often connect the TX from the bluetooth module to the TX of the Arduino, that won’t work. Make sure you connect: TX goes to RX and RX goes to TX. If the HC-04/HC-06&HC-05 bluetooth module asks for a password, it’s ’1234′. Do you know a friend that would like to see this project? Make sure you share this project with your friend! 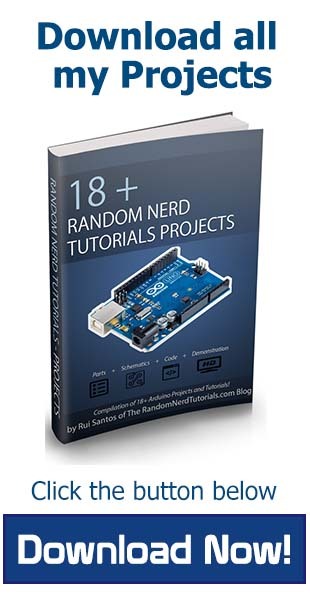 Do you want to learn more about building apps for Arduino? Get access to our course: Android Apps for Arduino with MIT App Inventor 2. P.S. If you don’t have a bluetooth module, read my HC-05 review here. it was awesome and i used it for my bluetooth controlled robot!!! What is the process ? Can we order online ? Hi Raj, i am Renu from bangalore. You can download the pdf and get it printed. i already did it for my sumobot project… but i get the idea from your previous video that control one dc motor.. and i’m really thankful to to this site… may i ask you if the android app that you use in this video is your own code..? Yes this Android app was created by me using MIT App Inventor. Thanks so much for your feedback Wagner! Hey Henry! Thanks for stopping by and try my project! which version of the Arduino IDE you’re using? The DC motors should only be moving after you pressed some buttons. First try to control the DC motors with the serial monitor by sending ‘1’, ‘2’, etc . And they should be working just fine. Please let me know if it’s working! hi rui… i want try this tutorial. but do u have full source code app in android ? and what apps to use that’s apps? ECLIPSE ? or ANDROID STUIDO ? . Hi Iman! thanks for leaving a comment! I don’t have the Java code… I recommend you to read this tutorial that I’ve just released and you’ll understand how you can create your own apps for android… without using Java! Let me know if this answered your question. my question . why u dont use motor shield ? yes you can definitely use one if you have one! So if you have a motor shield go for it. Yes you can definitely do that! But if you prefer to use a Dual H-Bridge it will work exactly the same! Another question. Did you use any voltage divider for the output to the Bluetooth module? Do I have to use a voltage divider? Some people prefer to do that way! So you are not using a divider. I think I will do just like you. can i use Bluetooth Serial Module (HC-05 Master/Slave mode) in this project ? becuse i’m not sure this module have 6 pin. I’m using the HC-05 and my Bluetooth module only has 4 pins! Send me a link please and I’ll take a look! I think It will work with that bluetooth module… but please do a bit of research first… I’m not completely sure. How can i convert a zip file to get load on my anroid phone…. First Unzip that file and then inside it’s a .apk file. just to let you know. Ive Powered my HC-07 Module with 3.3v and without using voltage divider for the output of the arduino. it worked well for 5 min only. then the HC-07 STOP working. i think the my bluetooth module has burnt or damaged permanently :(. That’s really weird … Never happened to me… the voltage divider is supposed to stable the connection.. but I thought It wasn’t necessary, because It always worked well for me. Did you tried again after that? It’s still not working? the small LED’s don’t blink? I’ve got a question, does your arduino code just works with the hc-05 bluetooth module or I can use another one like the hc-06 ,this one has 4 pins? thanks for taking the time to watch my tutorials. I think by default it will work. They are exactly the same. but the HC-05 has some pins, and the HC-06 you need to solder wires. But they work the same. If so, how would I wire that in? Thanks! you can find that IC in almost any electronics store. I would prefer to buy this shield below. This has 2 IC’s (L293D) you can either use it with your Arduino. there are some libraries to work with this shield. Or simply remove the IC and use in your project! hola soy de chile y me encanto tu tutorial el problema es que no me deja bajar la aplicación desde mi teléfono… como lo puedo instalar? I don’t speak Spanish. but I know Portuguese. So I understood what you said. Simply enter your email and you’ll receive a secret download page with all my projects. Or you can simply click the like button and the code will unlock. And when the programming begins? Before we set all components to PCB or after? For what I’ve heard that LC-05 Bluetooth module works with my project. I’ve not tried it myself but it should work. the password and bluetooth configurations might be different. The programming is done in the Arduino. you don’t need to programm the Arduino Module. Thanks for taking the time to read my projects! hi. will this also work if we are going to use the accelerometer sensor of the smartphone? 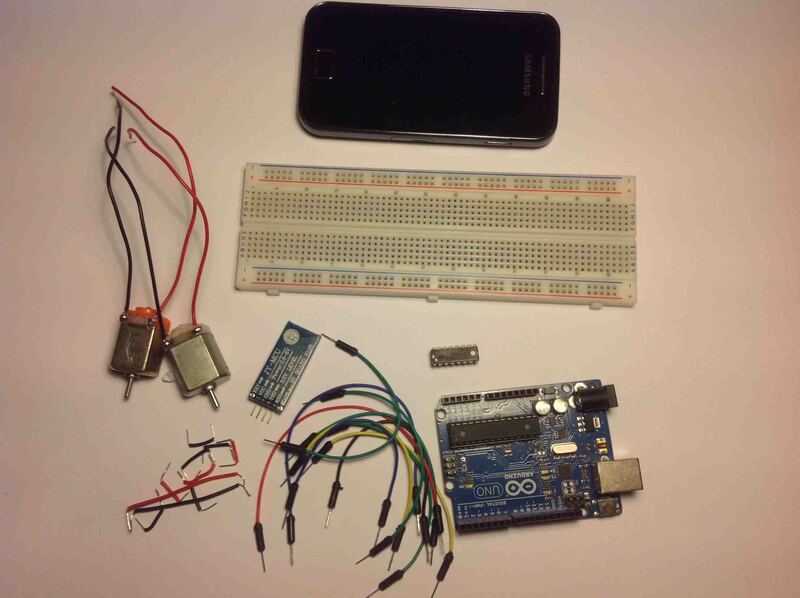 This project and idea can be used with the accelerometer of the smartphone. But in order to do that you will need to create a new app for your smartphone. the one I’m using on this tutorial was created with MIT app inventor. I wanna ask you something more about the password, when i pair the bluetooth modul they ask about pass but stil not work to connected. The bluetooth module dont ask about the pass. What i must to do? First go to your bluetooth settings and pair your smartphone with the Bluetooth module. As soon as it’s paired. Go to the ArdBlue app and click: “Choose device to connect to” and choose your bluetooth module. I hope this solves your questions. I have got a problem when I tried to set up the hardware of what you introduced above; however, I found out that there were signals of int1 and int4 were locked to turn on the LED light and one of motors was continuously running forward only (another one was stopped) when I used generic motors to connect L298 development board module, which was connected to Arduino Uno development board. I could not control pinint1 to pinint4 by using your Skretch programme. I tried not to supply power to motor and only run your sktech program to send signal to control pinint1 to pinint4 of L298, it was successful for me to see the response of the MCU controling normal. Could you tell me what wrong with my hardware setting? Does noise come from the motor since the ground is commonly connected between L298 and Arduino Uno? How can I solve this problem please? Can you tell me exactly which motor board are you using? You’re debugging all your code using the Arduino IDE? right? which DC motors are you using? I fixed the problem already since being careless of matching pins between Atmega328 and L293D. I am using motor drive of L293D of Sparkle Brand to connect Arduino Uno. Thank you for your reply. I am urgent to know your opinion for the problem solving since this will become reference for my college project please. Thanks you very much. I am urgent to need knowing your opinion since I will take your tutorial case as a example for my owned project. Could you reply me as soon as possible please? So feel free to edit and share my code. of course, I just reference your codes for evaulation only and then I will write my owned code with adding other function, such as LED controlled by Andriod for the car, etc. É possível fazer uma aplicação parecida para controlar step motors? só tens que mudar o código do Arduino e em vez de controlares um DC motor é um stepper motor. Tenta procurar um exemplo de Arduino com stepper motors para teres mais umas ideias! i have a problem with this arduino. My dc motor can run if i connect with my laptop (usb) but with 9v battery cannot run. Blueterm not response if i enter numbers with 9v battery, but with usb, the blueterm is completely response and my dc motor run (left, right, off). Why? Hi, thanks for trying my projects.. The 9V battery don’t have enough current for your circuit, you will need another type of battery that can handle more current. The bluetooth module and DC motors takes to much current from the 9V battery. That question requires almost an entire tutorial. What I can tell you right now is that it works like it does with the Arduino… The bluetooth module will establish a communication via the TX and RX pins. and your smartphone will establish a communication with the bluetooth module. hi..is it possible to power up arduino like in your project with 18v dc supply (2 9v dc battery connected in series)? ?since it doesnt work in 9v dc supply? ?and what can you advice to me to power up my bluetooth controlled robot..
Don’t do that… That’s not a good idea. Too much current probably. One way to do that is using AA batteries with some battery holder. The best way is to get a LiPo rechargeable battery for the Arduino. before you buy anything make sure you get the right for your motors too. I hope this helps bryle! Hi, Thanks you for your remind. Yes, it may be lack of current for 9Vlot battery. In adddition, I had use your Android app and would like to add on new things on it. However, I do not how to open your attahced files such as .src and project.perproties Could you tell me how I can open your generic Android app source code in App Inventor please? I know that I have to use App Inventor on MIT wedsite, is there an off-line App Inventor for me to run the changing of the source code on Window platform please? I’ve made a video using MIT app inventor. It runs on the browser and windows at the same time. Please watch the video on that post where I explain everything. Let me know if you have any questions! thanks a lot rui..for helping.. Some IC’s have different versions, the L293D as some variations just like the L293DNE. I just took a quick look and they seem to work exactly the same. But before you test anything check both IC’s datasheets and compare the pins Inputs and Outputs and voltages. Could you tell me which development platform for me to edit soruce code for BlueArd please? Is it Eplice or Oracle Java Development Platform? When you download that .zip folder it comes with 3 files. The BlueArd.apk is the app installation file. If you want to edit the app simply upload the BlueArd Source files into MIT APP Inventor. Thank you for your answer; howver, is it possible for me to edit the source code of the app by using off-line App Inventor or other opensource freeware please? In addition, I’ve got another problem that I could contorl turn left and right of the mobile robot using Android cell phone; but the robot could not be morved forward and backward, somethimes left wheel was moving meanwhile right wheel was not moving in parallel speed. I wonder whether the circuit power could not supply to motors via L293D since I am using 9 Vltage battery to supply power the whole MCU control circuit board and L293D. My tutor told me that it shall be supplied of power to motors vis L293D independently. Could you share with me your opinion please? I had followed your suggestion to open BlueArd project source code, but the online program prompted me error since your project.property file is not .aia file. I could not attach the print screen for your reference; would you advise where I can download your a completed update projecy source codes please? They updated their entire website. Right now I don’t have the time do that… in 2 weeks or something I’ll create a new source code. Yes. MIT App Inventor updated to version 2; but finally I could find out the old version to edit your soure codes. Many thanks. I am using a single 9v battery and following your tutorial exactly. Also I am using 2 12v dc motors (60rpm). Is the 9v battery suuficient to run the motors? If not, what alternative can i use? No… the 9V battery won’t be able to handle that. I would recommend you to get some Lipo rechargeable batteries for your project! I purchased an hc 05.. but it has 6 pins.. There are 2 voltage pins.. 5v and 3.3v.. Which pin should i connect to my arduino..also do i need a voltage divider to connect my hc 05 rx tx pins to arduino? You can use either the 5V or the 3.3V… it’s you choice. yes I recommend you to use a voltage divider ! Also i tried creating your app in MIT App Inventor 2..it shows an error when i try to connect HC-05 in the list..the error says unbound null.. Here is the image of my blocks.. Thanks Merry Christmas for you too! You don’t need the voltage divider for regulated power supplies. But to be 100% sure always use the voltage divider. please help me is for my final semester project please. congratulations and greetings from grasias por conpartir PERU 2014 and happy new year hope your prompt help. Does the stop, forward, backward commands work when you’re testing you’re project using only the Arduino Serial monitor? I’m bad english language. Go! with left and right with reverse working how to solve. I didn’t understand your question, could you please repeat again? Press Right ! GO working is like . Sir gudeve happy new year can i ask u a question how can i edit ur android app?? Please first read the update on top of this page. then you need to download the source code provided. it include a .zip folder with 3 files inside. Unzip it and you need to upload the BlueArd Source files into App inventor. Thanks for this great tutorial. I have downloaded your source code and have it setup. I am hoping to add in some buttons for lights and other functions, but was wondering how you figured out which byte number to send to correspond to the arduino pin. Button1 (GO!) = 49, which drives motors forward. I’m happy to send you the code when I have it implemented. How did you figure out which byte number to send to correspond to the arduino pin. Example: Button1 (GO!) = 49, which drives motors forward from a pin. If I wanted to turn on a light using digital input 8, what byte would I send? if you want to turn on a light using the digital pin 8 you can create an if statement for example. and the Android app would send a 49 to the arduino via bluetooth. if you want to turn off for instance you can do this. The Android app will send a 50 via bluetooth. this is just an example you can send any values you want and you arduino code can do whatever you want. I am following your project and using 2 12v DC motors. I am making an independent robot so won’t be providing power through USB. I am thinking of providing external power supply to Vc pin of l293d which provide power for the motors only instead of directly connecting it with the 5v pin of arduino. So what do you suggest as a power supply for arduino and power supply for the motors separately? As you said you need an external power supply. If it’s to control something that need to be in movement like a robot. I would get a Lipo rechargeable battery to power up those motors. what exact current do i need to run the motor like a robot?? and see how much voltage and current it needs to work properly. that error happens you when you’re installing the app? or while you’re trying to connect to the bluetooth module? I apologise but I don’t speak french I only speak English or Portuguese sorry. If you want to download my source code for this project, you can either click like on the locked content. Can you share with me a print of the problem or something? To create this android app I’m using MIT APP Inventor, as it says on the top of this post. You can download all my code by clicking “like” or “tweet” and my code will unlock. It’s a simple introduction to MIT App inventor by creating a blink LED project. Thnx for tutorial, it really helped a lot. Can you please tell me from where I can download your app. The app can be download from this page. Just click like or tweet. and i want to learn how to creat app in app inventor …. Dear Random Archive BlueArd Source (for editing purpose), I can not open from the MIT App Inventor please point me how I can edit? The source for this project can only be edited with MIT App inventor Classic version. It won’t open with AI2. Vou lançar mais um projecto com bluetooth amanhã (sábado) com o novo MIT App Inventor 2. I have a question, why pin Vcc Bluetooth HC-05 has been given 5V DC from pin 5V DC Arduino (as a reference datasheet Bluetooth HC-05 max 3.3V) ? It could be damage, isn’t it? Hi, I am creating a app used in bluetooth control wheelchair via arduino in my project. Your design inspire me a lot, thank you! However, I have a problem, I downloaded your source which used in app inventor and arduino code.When I ran it, the app said my android phone was connected bluetooth with arduino but it had no response when I clicked the button on my phone. The strange thing is that it responses correctly when I enter signal by serial monitor like “1”,”2″,”3″. I can’t find out the problem, do you have any idea? I’m really glad I could help! hi sir, what other types of bluetooth module that are compatible with this project? I’ve only tested this project with this bluetooth module. If you already have a different one you should try. This project should work just fine with any bluetooth module, because all of them establish a serial communication with the Arduino. Nice app U got there! I have one dc motor to control! that should be a problem! i would love to change your app so there were 4 buttons !2 of them just the way it is – on a push it sends a comand but 2 of them would be working like so – when i push it and hold it – it would send letter A to arduino and on a release it would send lower case coreseponding comand letter , in this case a! and for other button B,b! BUT THERE IS ONE PROBLEM – i don`t know how to make such a button witch works on touch and release…. I’m glad you found my app useful. I recommend you to test my project first and see if it’s working for you. Then open my app with MIT App inventor and start getting familiar with the programming environment. It’s pretty easy to do what you’re looking for. They have pre-built in functions to trigger actions On click buttons for example. Still can`t find a way to edit a button to make it work like i need to….on a push it would send a capital A and on a release it would send lower case letter a ! Have you tried my project first? What have you done so far with MIT App Inventor? There’s a built-in function called LongClick, that should do exactly what you’re looking for. does this bluetooth module HC-06 works correctly with this project? yes Amarendra, that bluetooth Module should work just fine! thanks for my last question. How we will supply power to arduino in wireless projects? You can supply the arduino with a rechargeable battery for example! thanks for assisting me in this project. Ok thanks Rui! i`ll give it a try! Would even these comands go to arduino serial like when i send them trough arduino serial monitor? I don’t have the time to make the code for everyone who asks me sorry. There’s simply not enough time in the day to do that. I already told you you can use the long click function to do that. and you can use a NOT logic block for example to see when you stop pressing the buttons. I guess you can change most of the arduino code to do exactly that. and don’t worry so much with the app. Sorry for not being able to help you much more than this. first of all thank you for your awesome description!! Do you know a way to to this? Please read some of the comments above. I think that can be accomplished with the LongClick feature of the buttons. and the change the arduino code to be able to do that. When will you upload the app inventor 2 sketch? I don’t have time to update those projects right now. And they work just fine with Beta MIT App Inventor. You can check my two most recent project with MIT App Inventor 2. Both Beta MIT app Inventor and the new version work really similar. pls sort out my issue. Can you try this project with another smartphone? It might be a compatibility problem with yours i guess. How to change the baud rate of the bluetooth module? Mine (HC-06) has default baud rate of 38400. I want to change it to 9600, need you valuable advice. just wanna ask one thing if I want to activate an alarm whenever I stop the motors, does it possible with extra components and if yes please help me! That’s something you can easily do. Simply add a new OUTPUT in the Arduino (a new digital pin). That way you can control some type of buzzer. I want to use the captor LM35 in the program but i didn’t found his library , can you help me please! !thanks for anticipation . Can you send me a link for the part you want a library? And I’ll see if I can’t find. Hi, currently I’m working on this similar project but controlling the mobile robot through the accelerometer sensor. Now, I’m facing problem on my Bluetooth connection. I successfully pairing both my android and arduino uno. On the serial monitor it shows the data but my DC motor is not rotate. I dont know why. Do I need to setup or configure anything with the Bluetooth module?? This is my first time using arduino with bluetooth connection and I’m really noob. Help me pls..
have you started making the code for the accelerometer? If you’re trying to use the bluetooth project for the first time. I recommend you to test my project first as an example and see if it works for you. Then later start creating your own projects. At the moment I develop my own apps using MIT App Inventor..In fact, I also try to use the available apps by downloading them..sadly both of the apps didn’t work. What do you mean code for accelerometer? Is it the arduino code or the apps code? Which app didn’t work for you? you can use the accelerometer function on the app. It’s provided on MIT App Inventor. The apps that I’ve develop and download. Both didn’t work. Yes, I already include accelerometer function on MIT App Inventor in my app. But what have you tried? im doing the same project.here in tutorial i cant see that you connect a power supply for l293d driver. yes you can’t see any power supply, but just notice a cable attached to Arduino, that is supplying power to Arduino. could you help to build an app like that by sharing the screen shots of “DESIGNER” AND “BLOCK”? Hey Rui Thanks for the awesome tutorial.. I am trying to implement the same project using the same parts and arduino duemilanove now the problem is i am able to control the motors via the serial monitor of the ide but not via Bluetooth neither app or blueterm. I have tested the bluetoth module for communication via the led blink example. Have you tried all the steps I tell you on the tips? Are the bluetooth cables connected to the Arduino properly? If I remove Arduino’s Atmega328 IC and build the same circuitry on the breadboard by using 16MHz crystal and other components (that we can use to make arduino uno on breadboard)? f I remove Arduino’s Atmega328 IC and build the same circuitry on the breadboard by using 16MHz crystal and other components (that we can use to make arduino uno on breadboard)the would program or sketch uploaded on it work? yeah It will work just fine Pritesh. You can find plenty of information if you search on the web for something like, Arduino on a breadboard. Boas Rui , é o seguinte eu fiz a ligação certa como metes-te ai mas quando ligo o arduino ao computador para alimentar o arduino começa a fazer um barulho sabes como resolve-lo ? O Arduino começa a fazer barulho? Isso tambem acontece com um simples LED a piscar? Não , foi a primeira vez que aquilo aconteceu-me e não percebi muito bem , vou desmonta–lo em principio de novo e voltar a montar para experimentar outra vez . Okok depois diz-me se já está a funcionar. This is my error : “Runtime Error : need BLUETOOTH_ADMIN permission”. I think it may be in your BlueArd. that’s a problem with your bluetooth setting. that never happened to me though. Do u hv any idea of how to control the speed of the motor using app inventor and corresponding code for arduino? I saw a video in youtube. Plz reply asap if u can help. I’m trying to add a couple more buttons to the app that you built for the motor control. I’m controlling three different motors (each with different drivers) and I need two more buttons to control forward and backward movement. I’ve got two motors working like a charm, no problem. The issue that I’m running into is that I don’t know what “number” to assign for the bluetoothclient byte to send to the android. I figured it would just continue on from the previous ones, 54…55…56, but that didn’t work. Those numbers 49,50, etc… are not random numbers I’ve decided to attribute. Those are numbers from the ASCII table. You can combine my project with that tutorial and control your the DC motor with the shield. Please contact me trough the contact form for more details. this is my first write to you, I am working on “LED On-Off application” this is very simple application.I am using HC-05 bluetooth module, arduino UNO and Android development tools like Eclipse. I have tried lots of android application but does not work for me. can you please help me in developing a simple LED on-off two button application in android. But can’t find this BLUEARD App, so can u please help me with the download of BLUEARD app. you can download the app by clicking “Like” or “tweet”. Thank You!!!!!!!!!!!!! For sharing this Page. in our institute. We really liked this….. Its a great website created by you, helping young engineers. Ola, estou a tentar fazer este projecto mas infelizmente não funciona. Quando carrego num botão na app, o arduino parece receber a informação mas os motores não andam… tenho o HC-07 e o linvor, qual o melhor? Qualquer modulo de bluetooth que funcione por comunicaçao serial deve funcionar bem com o meu projeto. Um dos problemas comuns poder ser que o seu modulo de bluetooth venha mal configurado/ou com outra configuraçao por defeito. and i have done this project and it is working perfectly fine, and now i’m willing to add few more buttons to that app so that i can perform few more tasks, can u please send that .aia file of 2 dc motor control to me so that i can improve this project little. Sorry I don’t have the .aia file for this project. This project was done with the first version of MIT App Inventor. Thank you for your feedback! More projects coming out pretty soon! Hi Rui, if is to add in 2 limit switch between the motor to let it toggle forward and reverse, is it possible? Which is exactly the switch you’re talking about? hi Rui..i already try your project.i got this problem..the motor wont rotate when i press 2.. but it functioning well when im press 1 or 0..can you help me. Are you sure the L293D IC is well wired? hi.. i have problem with the motor. the motor cannot function well. only one motor can rotate at one time. i use bluetooth spp and bluebee. is it effect the circuit?? Can you send me the links to those devices? This project works with the Leonardo. Hi! Thanks for these awesome tutorials!! When I try to connect my phone to Bluetooth it cannot find any nearby Bluetooth devices to connect to. Do you know what the problem is? Have you tried your bluetooth module with other projects? how far are you trying to connect? This is my first project using it. Is it just defective? I’m trying to connect from about a foot away. It might be, I’m not sure though. Otherwise if you follow my exact steps it should work just fine. hei Rui,,,,if i want to change the pin from arduino….can it still be working …. which pins you want to change? Ok this time I redid the circuit using your,single DC motor tutorial. I connect via blueterm and it actually worked! But then I got more problems. It would disconnect and I would have to reconnect. Then it would say it was connected but when I tried to send a command it would disconnect again. Now it won’t connect at all. The company is sending me a new one since they actually sent me the wrong one that had six pins instead of four. It should still work though, even with six. So for now I’ll just assume it’s defective and wait for my new one. I hope it at least works. Hey how would I send a command that only makes the DC motor turn on for 10 seconds then turn off? I’ve tried several methods but none seem to work. Thanks! thanks for the tutorial but can you please tell me what changes do i need to make so it would go forword as long as i press the botton on my mobile? I don’t think that works with MIT App Inventor. Hello Rui, thanks for tutorial. Can I use the L298 shield for this? http://www.robofun.ro/shields/shield-motoare-l298-v2 this is the one, it connects to arduino through pins 3, 5, 6, 9. Any major changes i have to do in the code? Regards! Compare their project examples with my code. You might need to add their library and just change a couple of lines from my code where I control the DC motor. hi, i want to ask, can i use HC-06 instead of HC-05? This project works just fine with that bluetooth module, since both HC-05 and HC-06 are the same. At a time how many Bluetooth device can i connect to the mobile…..
You can only be connected to one bluetooth device at a time. good day sir . .is it possible for a 12v DC motor ?????…. Yes you can do that with a 12V DC motor. sir should i program first the arduino before connecting the bluetooth module?????? sir can you help me with my project . . .i want to add a water sprinkler to your project . . . when i click “GO!” the sprinkler will turn on . . and stop after a few seconds . . .
Good job . It is a very good tutorial. When I connected the Arduino TX cable to bluetooth TX and the Arduino RX to bluetooth RX, on the serial monitor numbers 1,2,3,4,5 work fine. But when I connected the Arduino TX cable to bluetooth RX and the Arduino RX to bluetooth TX, on the serial monitor numbers 1,2,3,4,5 don’t work. Why? That’s impossible, unless the pins are labeled incorrectly. Ruis master why his software can not be used when connected to bluetooth hc-05? whether the application program of android is wrong ..? Sorry Doni, I didn’t understand your question, what do you mean? On the serial monitor numbers 1,2,3,4,5 work fine as your description. I can connected the phone to bluetooth, but with the phone I couldn’t control motors. It’s below the heading “Download all my source code below”, click to download and install the application in your smartphone. to read this blog, and I used to go to see this webpage every day. Your application did help me a lot in my project, however, I want to change it a little bit. I want my application to send the ASCI value as long as the button is pressed and when the button is released it would stop sending the value, I want to control my robot with that application but without a stop button, well I am a little new to the android programming and I need your little help to do that. Can you help? Thanks in Advance. The apk download link is not working. I’ve just tried the link myself and it works… Please try again. i make all the connections well and when i send “1””2″ecc. from the serialmonitor the motors works but when i try to control them from bluetooth don’t happen anything what i’m doing wrong? I have one problem to modify your android app. I download all those codes which you was given. How to modify when i extract the files it came an APK file, arduino sketch and source code for APK. Where can i use that apk source code to modify your android app with my convenience. Would this set up work with 360 servos, or would it need altering? You have to change the arduino code to work properly with servos. Check the example code for the servo library in the Arduino IDE examples tab. I tried this project today and it worked well. Why is it that when I connect the motor pins directly to arduino pins, the motor won’t work but after using a motor driver IC, it works fine. Where does the current required come from even when no other external power supply is used? Also, I need the motor to turn off after 5 sec of operation. I tried”delay(5000);” but that has not solved the problem. Any bright ideas. Which program? The Arduino IDE? MIT APP Inventor? wen you gave go (forward) command both the motors started spinning ..
so please help me out of this …!! if u can please message me on “kasarshubham05@gmail.com” it would be nice. i have downloaded the android app from zip file. If you follow exactly my tutorial you don’t need to configure anything else. Yes you have to upload the Arduino sketch I’ve mentioned in this blog post. I want to edit the MIT App how to edit/import the Bluetooth project in MIT App. It is asking .aia file extension…the bluetooth zip folder does not have this file. Please read carefully the top update at the beginning of this blog post. Able to import the code base given for Bluetooth. so i tried the codes and the serial monitor replied properly but the dc motors are not moving.. any idea why this happened? Does you bluetooth module operates at the same baud rate as mine? Can you share your code android to me ? i have question for PWM on PIN 1 also connect to PWM on PIN 0? Buenas Rui Santos ! Quería la programación con el arduino uno 2 motores dc independiente controlado vía bluetooth como el del enlace: https://randomnerdtutorials.com/arduino-control-2-dc-motors-via-bluetooth/ La podría publicar o mandarla al correo. Hi,To take a picture of the blocks? I ma fan of yours great projects…we all are implementing them in our college projects…..I had experinced a problem in implementing this project it is connecting fine with HC-05 module but when i press forward button the motors are not moving …please tell me the possible reason for the following error..please give a bit of your valuable time for my problem..
Can I use hc-06 bluetooth module?? why i can’t connect to my robot bluetooth? when i click “choose device to connect to” on ur app, then choose my bluetooth name, then suddenly appear “Need bluetooth_Admin permission :neither user 10130 nor current process has android.permission. BLUETOOTH_ADMIN.” why? info to work on. You’ve done an impressive activity and our whole community can be grateful to you. If i need to control 2 dc motors, and I have the motor shield, I just upload the code to the Arduino and it works? Problem : I have connected circuit as given in your diagram but the motors do not corresponds when i try to check by entering 1,2,3 …..
in the serial monitor . What’s the problem can you explain it ? Did you remove the bluetooth module from the TX and RX lines while testing to send commands via serial monitor? Thx , a lot Bro .I could control the two DC motors with smartphone because of you .Thx once again . PROBLEM : But , When i tested it at that time I Supplied Power through the ‘Cable connected to Computer’. BUT I Want to Power through “9V Battery” . So where should I Plug the ‘Battery’ .Please Help me as early as Possible !!!!!!!! I am using HC-05 Module and Arduino Uno , so how much power should I supply and where should I plug the Battery. I am using HC-05 Module and Arduino Uno , so how much power should I supply and where should I plug the Battery.I am supplying 3.3 V to HC module through arduino. Where should I plug the Battery ???? How can I get the code of the app blue Ard ? You can download the code from this page. like ur project and am about to do it i hope. and in wich programing language its written. Please read the top of this blog post! Hi Rui, I really like your stuff and I just published a bluetooth app specifically for controlling Arduino robots. Let me know what you think and if it’s helpful. Well, I am kind of a begginer so I was hoping that u could help me by giving me some hints. Thanks man! Rui, baixei seu programa para ver como ele é feito pra aprender um pouco, mas o app inventor classic não está mais funcionando… tem outra forma que eu possa ver seu aplicativo? Queria entender os códigos pra aprender… Obrigado e parabéns pela iniciativa! sir how can i view the screen of you android apk so i can edit it what application should i use? Please read carefully the top of the blog post for those instructions. can i get code used in dis ? Are you using DC motor that are 5V rated? sorry, may you send me the app inventor (apps code to smartphone via bluetooth) to my email, please? may you send me that aia file ? because i want to edit the app in app inventor,please ?? I don’t that file, please read the top description of this blog post. wow sir you are genius.i like your all project. I’m not sure… What exactly happens? then it ends the applicaiton. Can you help me what might be the issue?? I’d like to modify the app you made for this, but it can no longer be imported into the newer MIT app inventor. I even tried the converter they have, but that did not work. Do you have an updated version of the app source code? I am using motor controller l293d but I have that board motor controller so what is t the wiring for that you can tell me please. I don’t have any information for that exact board..
is it possible to run 4 motors, two motors for vehicle moving and another two motors are run for some special purpose. if it is possible give me some explanation it is helpful to my project. Thanks, Rui, this is exactly what I needed to get started. Although I will be using a downloaded app (there are plenty, each sending different set commands), your code is pretty universal and basically helps me put things together and expand it in the future, perhaps by adding the obstacle avoiding feature (in an if/else statement, I suppose statement), etc. Can I replace the L293D IC with an L298N motor driver to control my two DC motors? Do I have to change the code at all if I do? That module should work just fine with the code provided. You just need to make sure you wire the DC motor to the motor driver properly. Primeiro que tudo, obrigado pelo teu esforço em disponibilizares este conteúdo de graça. Muito obrigado. Estou a experimentar o teu projeto e, sem mexer em nada no programa, o meu motor assinalado com “motor2” no pin 1 não funciona. Simplesmente parece que não recebe a ordem. Estou a tentar com o Serial Monitor e ainda não passei para o módulo Bluetooth. O que é que poderá ser? Please help me. How can i make to motor motor to rotate slowly.Please help.Very important for my project. The setup is all set but i want the motor to run slowly. In which motor value is a value between 0 and 255 (255 is maximum speed). This way you can control the speed. Hello sir, is it fine if i use other app instead of MIT? and is the code works the same? This code was built for the companion MIT App Inventor. It won’t work with a different application, unless it sends the exact same commands to the Arduino. You need to change the code to be compatible with your own application. Is there any mit coding if changing the IC to motor driver? We just have the example for the motor drive in this tutorial. Hey very good project bro, but can you send the connection with L298 motor driver. We don’t have a guide for that motor driver with the Arduino. But we have a guide with the L298 motor driver with the ESP32.